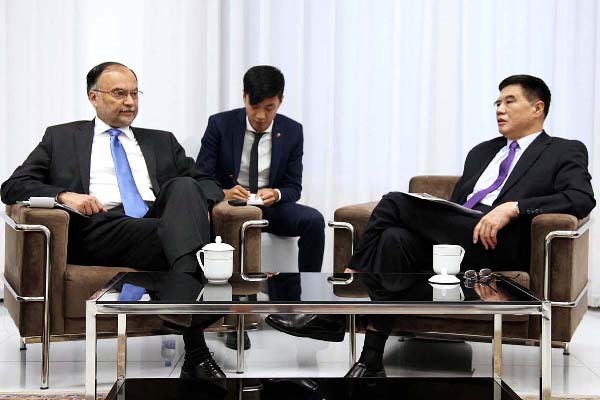 ISLAMABAD, Sep 26 (APP): Federal Minister for Planning, Development and Reform Prof. Ahsan Iqbal met China Center for International Economic Exchanges (CCIEE) and discussed opportunities of cooperation besides exploring ways and means to further extend the magnitude and scope of the China-Pakistan Economic Corridor (CPEC). During the meeting held in Beijing, both sides expressed satisfaction over the progress on CPEC and hoped to create new platforms for diversifying cooperation in areas of knowledge sharing and governance issues of public policy. Appreciating the significance of CPEC, Executive Vice Chairman and Chief Executive Officer and former Vice Chairman of the National Development and Reform Commission of China Zhang Xiaoqiang Zhang said that CPEC’s progression was faster than any of the other corridors. CPEC is a project of friendship, openness and inclusiveness and is not targeted against any country, he added. Ansan Iqbal appreciated the services rendered by Zhang Xiaoqiang as Vice Chairman of the National Development and Reform Commission of China and first co-chair of CPEC Joint Coordination Committee(JCC) in preparing a roadmap for speedy progress of CPEC projects and said that CPEC was about openness, inclusiveness and prosperity and the corridor provided an opportunity to neighboring countries do trade with China in a very economical way. He said, under CPEC, Pakistan was doing many projects with China in its hardware component comprising energy and infrastructure however, there was a need to create platforms for the software component such as knowledge sharing. The CCIEE CEO shared the view that apart from hardware cooperation in energy and infrastructure, software cooperation was also very important. He said that China had experienced many cooperative initiatives with other countries in city planning and establishment industrial parks. He said that on the lines of other joint working groups , establishment of contact groups of local government, think tanks, universities, to interact on urban planning solutions and share ideas on other software side of CPEC in consultation with National Development and Reform Commission of China could be explored. He said that China’s success in development was made possible due to a healthy combination of stability, development and reforms. The Minister said that Pakistan Institute of Development Economics (PIDE) and CCIEE could develop strong linkages. PIDE has set up a Center of Excellence on CPEC.